A woman went viral for breastfeeding, so why’s her husband in trouble? 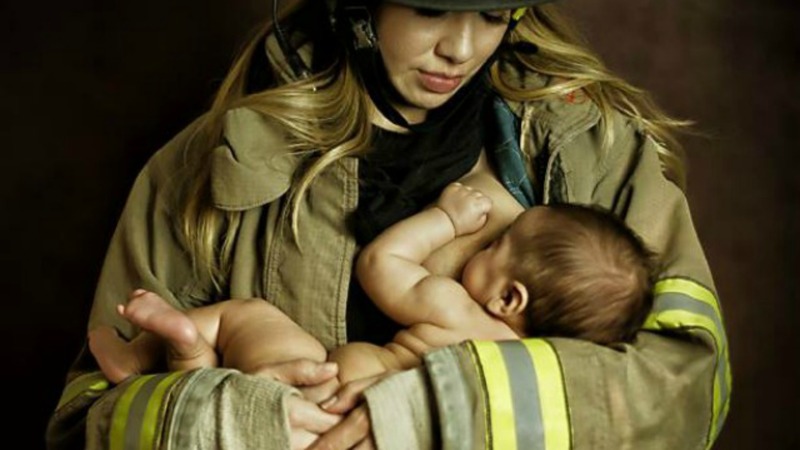 We all swooned over the amazing picture of a mom breastfeeding her baby in a firefighter’s uniform earlier this year, but now it’s back in the news for all the wrong reasons. The image was part of a series of breastfeeding working moms by El Paso photographer Tara Ruby. For the shoot, the mom wore her husband’s firefighter uniform — and now he’s facing disciplinary action. The unidentified Las Cruces firefighter is reportedly now on unpaid leave, although a spokesperson from the fire department said because it is a personnel matter, they cannot discuss any aspect of it. It seems absolutely crazy that any action should be taken against the father for what should only be seen as a stunning image of his wife and child. Don’t we often see images in the media of firefighters, police officers and other men in uniform in various states of undress? How can an image of a woman nursing her infant — one of the most natural human acts — be any more of a problem than those images? And what about kids who visit fire stations and try on the uniforms for their parents or teachers to take pictures? Or children who wear their moms’ or dads’ scrubs to go trick-or-treating? When it comes to wearing uniforms outside of work (or letting other people wear them), where do we draw the line? It turns out that isn’t so easy. Some professions have stricter guidelines and protocols than others, but in most cases there is some room for flexibility. Common sense dictates that any decision to wear a uniform outside of work shouldn’t be made lightly. For example, it’s probably not the best idea for a police officer to wear his or her uniform to down shots at a bar. “If you do wear your uniform when off duty, you have to remember that you’re representing your profession, and act accordingly at all times,” one firefighter told SheKnows. That’s completely reasonable. But letting your wife wear your firefighter jacket for a private photo shoot is quite a unique scenario. It’s not in public, and it’s certainly not disrespecting the courageous men and women who risk their lives for other people during the course of their jobs. When Ruby made waves last year for her image of women breastfeeding (while off duty) in their military uniforms, the U.S. Army responded with praise. What a shame the Las Cruces Fire Department couldn’t have shown their employee and his family the same support by celebrating their photograph — now that would have been great PR for everybody.